Joanna Barnett was born in Atlanta, Georgia on March 12, 1945, and grew up in Orlando, Florida. Her artistic talent was evident at an early age. She attended Florida Presbyterian College (later Eckerd College) and studied Fine Arts at Ringling School of Art, also for two years. In 1969 she moved to California. Over the years Joanna attended classes in life drawing, painting, and portraiture, rarely entering shows, but selling some work privately and occasionally accepting portrait commissions. She worked in a variety of media and styles. Her work is predominantly figurative with a strong Symbolist bent. She wrote that her work portrays “the internal affairs of women . . . , and the psychological aspects of introversion because it is what I experience most.” She claimed Cezanne, Jung, and Experience as her major influences. At a low point in 1985, her therapist suggested that she “just draw” what she felt. Joanna challenged herself to draw something every day for 40 days. She began with a self-portrait, for want of a better idea. 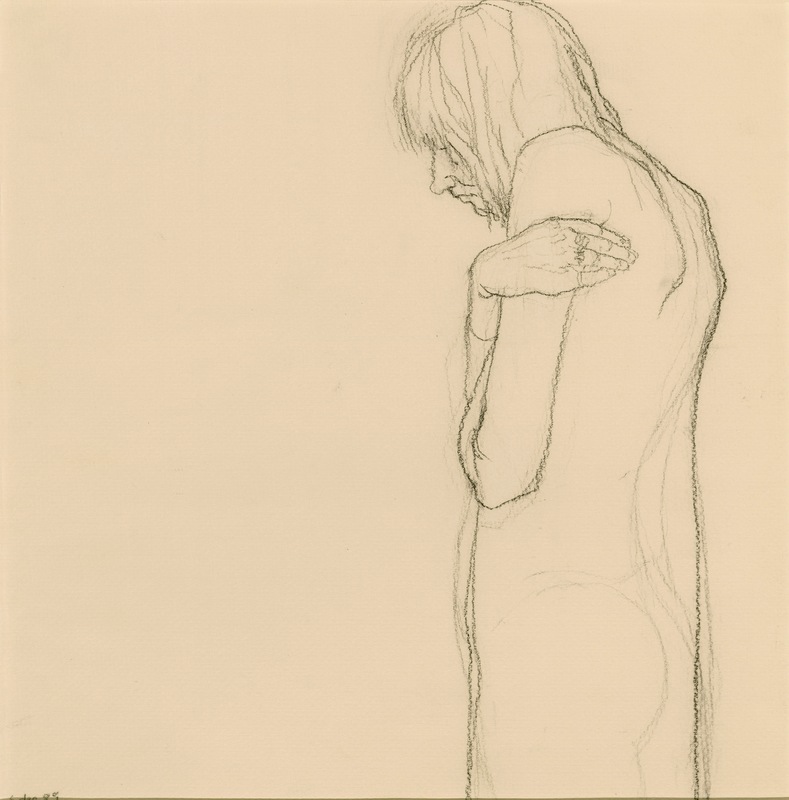 As she drew and wrote commentaries for 40 portraits, she viewed the collection as a “visual portrayal” of her illness. Years later, Joanna submitted the group of self-portraits to THE JOURNAL—a quarterly publication of the California Alliance for the Mentally Ill. Taken by the collection’s poignancy and its value to others suffering from mental illness, editor/publisher Dan E. Weisburd gladly accepted the work and in 1995 published “Forty Self-Portraits in 40 Days.” The article included the 40 portraits and 40 commentaries, as well as an introduction and afterword by Joanna (see In the Artist’s Words). The cover of a subsequent issue of the magazine featured Joanna’s “Woman with a Fish bird,” her self-portrait for Day 33. Joanna died on August 8, 1994, from a combination of causes, but primarily malnutrition and pneumonia. Her brother John and some friends buried her in California under a great live oak at the top of a hill near a spring. Concerned about keeping the collection intact, her aunt Joyce recovered Joanna’s work after her death. Joyce’s grandniece, Alison Bushman, now maintains the Joanna Barnett collection. This project was conceived out of an exercise that was simply intended to be an emotional vent during a particularly difficult psychological period. It was a secondary consideration that it might break through the five-year block that had finally defeated any hope of continuing as an artist, the only hope I had of transcending the limits imposed by mental illness. I was approaching another breakdown, and both my therapist and I knew that there was no certain way to prevent it. His suggestion that I draw, just draw what I felt, made me furious. If I tried I would surely fail, with tangible proof that I no longer possessed skill or vision. . . . His suggestion was so blatantly dangerous to my state of mind that I decided to do it if it killed me. . . . The first day, having nothing I wanted to draw, I drew myself. The second day, having nothing I wanted to draw, I again drew myself, and so began this composite self-portrait. I deliberately abandoned all artistic criteria and set myself the simplest of goals—that every drawing would be a portrait of myself—whatever self I happened to see that day. I decided to limit the drawings to forty. It seemed a significant number, and besides, it was my age. I must do only one drawing a day, and every one must be included, however inadequate it might be artistically or painful emotionally. I could not hide any embarrassing revelations of self. It was to be raw and real. After a while there was no face in the mirror, only an energy shaped by mood and event, and as the variations and changes multiplied, I began to see that this was a visual portrayal of my illness— the intensity of emotion, the drastic changes of mood, the instability of self-image — I was a personality caught in a kaleidoscope. As I confronted myself daily, four specific aspects emerged as both subjects and creators: The Woman, The Aliénée, The Artist, and The Intellect. The Woman approached herself in the throes of mid-life crisis. . . . She accepted non-existence. The Aliénée, the madwoman, was fascinated. . . . She endured the emotions, ignored the mirror, and played. For The Artist, it was like going back to school again. Faced with a new assignment each day, the failures seemed less important. It was The Intellect who saw it to completion. Constantly analyzing, reasoning, prodding, comforting—the Mistress of Chaos—she pulled it all apart and put it together again daily. . . . Such a simple goals, but it was a triumph for me. I fought for myself, I fought against myself, and I won. The project is done. I’ve done it! I actually persisted for forty days. Forty self-portraits. I did it! In spite of my accomplishment, I had fractured my image so many times that I could no longer see myself in the mirror. . . . When the fortieth drawing was done, I put them all away and the depression continued. I had thought I might find a self, a persona, embodied somewhere in this composite portrait, and instead I found a puzzle with too many pieces. I couldn’t fit them together to make a woman I recognized. In the chaos of images “I” was invisible. I gave up, accepting disintegration and the inevitability of living in bits and pieces. . . . I have accomplished a goal. . . . Life continues, changes continue, and I continue to learn, and to paint and write the experiences that continue. I once said to myself, “The truth hurts, and then it heals.” Think about it.